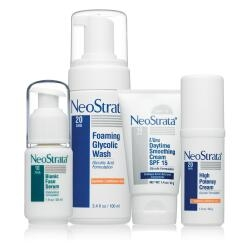 Neostrata is only available through doctors. These powerful corrective and preventative anti-aging products use advanced hydroxyacid technology to meet the needs of all individuals and skin types. NeoStrata products improve the visible signs of aging or sun-damaged skin and treat various dermatological conditions including acne, dry skin, hyperkeratosis and hyperpigmentation. Uniquely formulated with alpha hydroxyacids (AHAs), polyhydroxy acids (PHAs), and Bionic PHAs, these products can also enhance the therapeutic treatments and skincare recommended by physicians. Resurface your skin with Alpha Hydroxy Acids proven to have a remarkable effect on the top level of the skin, or the epidermis. Resurface products are ideal for normal skin types experiencing poor texture, including rough, dull skin, enlarged or congested pores, and fine lines and wrinkles. AHAs dissolve the bonds of thickened dead skin cells on the surface of the skin, causing exfoliation of the upper surface layers to reveal newer, hydrated, healthier skin. Esperienced AHA users prefer this extra-strengt exfoliating face cream that corrects the visible signs of photo aging with 15% Glycolic Acid. An extra-strength lotion for experienced AHA users to correct signs of aging, even and brighten skin tone, and improve skin texture. A potent, pH-balanced, foaming facial cleanser for experienced Glycolic Acid users who prefer a deep cleansing. A powerful moisturizer with Glycolic Acid and Lactobionic Acid to exfoliate, hydrate and restore aging skin on the face and neck. Restore: Restore your complexion with powerful anti-aging benefits for all skin types, including those with sensitive skin, atopic dermatitis or rosacea, and skin that is often unable to tolerate topical anti-aging treatments. These formulations contain naturally humectant Polyhydroxy Acids such as Gluconolactone and Lactobionic Acid, which strengthen skin’s protective barrier, making it less vulnerable to irritants, and reduce skin redness. An anti-aging daytime moisturizer with Gluconalactone and Lactobionic Acid to prevent and correct the visual signs of photo aging an all skin types. A highly emolient face cream with Polyhydroxy Acids designed to moisturize the skin while visibly reducing lines, wrinkles and other signs of photo aging. Soap-free foaming cleanser with Triclosan, a broad spectrum antibacterial, reaches deep into pores to dissolve impurities and help reduce problem-causing bacteria which can worsen conditions such as blemishes and rosacea. PHAs provide light exfoliation, while soothing chamomile extract and Pro-Vitamin B5 help condition skin. A comprehensive anti -aging system of potent professional products with active benefit ingredients that work synergistically to address the broadest spectrum of visible signs of aging. This unique SynerG Formula 8.5 lightly exfoliates without over drying, preparing the skin for optimal treatment benefits. Gently exfoliates skin without over drying. Stimulates the cell turnover rate. Contains an antioxidant blend to neutralize free radicals. Provides both UVA and UVB protection. Helps to reduce the appearance of discolorations. This unique formula employs a multi-mechanistic approach to building and plumping the delicate skin in the eye area. Containing Apple Stem Cell Extract, it protects the longevity of the skin’s own stem cells so your skin behaves like younger skin. Peptides stimulate matrix components to produce more collagen, and together with patented NeoGlucosamine, reinforce collagen’s surrounding support structure. Smoothes fine lines while giving a lifted appearance. Caffeine helps to deflate puffiness. Apple Stem Cell Extract helps to delay the effects of aging. Peptides enhance collagen and reduce the appearance of deep wrinkles. Glycolic Acid increases collagen production for plumper, fuller skin. Maltobionic Acid and Gluconolactone help repair damage in deep skin layers. Grape seed extract and SuperFruit antioxidant extracts of pomegranate blueberry and acai protect against cell aging. Offers eight antioxidants to fight oxidative damage and stop early signs of aging. Bionic and Polyhydroxy Acids help impede photoaging. Citric Acid, Lilac, Green Tea and Chardonnay Grape Seed Extracts counteract free radicals and maintain healthy DNA. Comforts skin with anti-inflammatory properties. SynerG 6.5 formula that boasts three lab-established technologies that focus on the production of new and the preservation of existing collagen. Collagen-boosting formula smoothes lines and wrinkles. Gardenia Cell Culture helps to maintain existing collagen structure and to motivate the production of new collagen. Amino Acids and Matrixyl 3000 Peptides boost new collagen production. NeoGlucosamine supports collagen’s defensive support matrix. Its unique, age-fighting ingredients are clinically proven to tighten skin and boost collagen, leaving skin smooth and rejuvenated with a youthful appearance. NeoStrata Skin Active Triple Firming Neck Cream uses powerful restructuring ingredients to lift and tighten loose skin. This cream fights signs of aging, evens skin tone, and supports collagen production to create a firm, youthful neck and decollete. Creates an even skin texture and tone. Target specific skin concerns with intensive treatments designed to address dark under eye circles, hyperpigmentation, age spots and acne marks, wrinkles, severe dry skin and more. NeoStrata targeted treatments are designed to complement or boost the benefits of your daily skin care regimen and are formulated with our breakthrough technology and the power of Polyhydroxy Acids. The combination fo 2% Salicylic Acid and Triple Alpha Hydroxy Acid belnd of Acetyl Mandelic Acid, Citirc Acid and Tartaric Acid, targets acne and blemishes directly. 100% of respondents had improvement in the appearance of fine lines, wrinkles, and skin clarity in 12 weeks of using this Gluconolactone, Pro-Retinol Vitamin E blend. This intensive treatment serum with 10% Lactobionic Acid helps restore radiance and improve skin texture while amplifying the benefits of other anti-aging products in your regimen. Strengthens delicate eye area to help hide dark under-eye circles. Dark circles, puffiness and fine lines are targeted and an antioxidant provides protection.